Impulse: get those hi-hats moving. While repetition is a fundamental feature of contemporary electronic music, one of the biggest challenges facing producers is the avoidance of monotony at both the macro and micro levels. We're always looking for new ways to imbue our sounds with life and movement; for example, with non-linear analogue emulation plugins to warm up 'cold', 'digital' sounds.Such techniques and tools can make our music sound alive and organic as opposed to artificial and robotic, but we can also harness unpredictability to break away from the inherent compositional tendencies that subconsciously guide us all, to generate unique ideas and sounds from scratch. 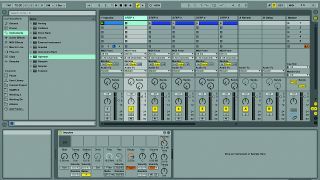 When Ableton introduced the Drum Rack format to Live in 2007, the huge flexibility it brought to the table convinced most Live users to pretty much abandon its less powerful percussion-orientated predecessor Impulse. But despite its limitations, Live's original multi-pad sample player boasts several unique features that shouldn't be overlooked, especially when it comes to drum programming. What makes Impulse stand out is the option to easily randomise the Transpose, Pan and filter Resonance for each sample slot. Impulse might not have velocity randomisation, but prefix it with a Velocity MIDI effect with the Random range turned up to vary the strength of your MIDI notes and there you have it. This also enables you to randomise Impulse's Stretch parameter, since it can be modulated by velocity. Below we'll use Impulse with Live's MIDI effects to create a generative hi-hat pattern that changes over time. This technique can be used with any percussive patterns and melodic sequences. Step 1: Start a new Live set and set the tempo to around 70bpm - a standard tempo for trap music. Create a new MIDI track and load an Impulse device onto it. Drag CH.wav (right click and save-as) onto the first sample slot. Now we have a hi-hat sample triggering on note C3. Step 2: We've made a backing track to accompany the hi-hat so that you can hear how it sounds in context - drop Beat1.wav (right click and save-as) onto an audio track. This is a simple trap beat made with samples from 194's InsideInfo sample pack. We'll generate our hi-hat patterns using just one note. Create a one-bar MIDI clip on the hi-hat track and fill it with a C3 note. Step 3: To transform our long MIDI note into a rhythmic pattern, we'll use Live's Arpeggiator MIDI effect - drop one in before Impulse. If you play the MIDI clip (or a C3 note on your MIDI keyboard), the default settings on Arpeggiator will generate eighth-notes synced to the project tempo. Step 4: Let's bring some life to the hi-hats with Impulse's randomisation features. To randomise the Pan position, set the Random parameter under the Pan knob to 40%. This randomly shifts the pan position with every incoming note, creating a more dynamic sound. Now set the Random parameter under the Transpose dial to around 35%. This introduces subtle changes in pitch. Step 5: We've applied random movement to the pitch and pan of our hi-hat sound, and the next step is to introduce some velocity variation, which simply controls the volume of the sounds generated by each note. Put a Velocity device after the Arpeggiator and set the Random factor to 25%. Now the velocity of the notes will be randomly adjusted up or down. Step 6: Finally, let's use randomisation to create an unpredictably evolving hi-hat pattern. Drag Max For Live's LFO MIDI device onto the hi-hat track. Set the wave Shape to Random, the Depth to 6% and the Offset to 0.10. Change the Time Mode from Freq to tempo Sync, and the Rate to 1/2, and Map the LFO to the Arpeggiator's Rate parameter.